Cambarellus patzcuarensis 'orange', also known as the dwarf orange crayfish, are a dwarf crayfish species selectively bred to have a striking orange color. They are appreciated by shrimp keepers for their peaceful nature and are the perfect addition to a shrimp-/invertebrate setup or even a community tank. Keep reading for everything you need to know about dwarf orange crayfish and keeping these crays in your own aquarium! With a maximum size of around 2 inches (5 cm), dwarf orange crayfish stay quite small. Contrary to their larger cousins they do fine in small aquariums; something around 10 gallons (38L) would be a great place to start. As with all aquarium inhabitants, a filter is a must when keeping dwarf orange crayfish. Without it, the tank won't cycle and your crayfish will be at risk. If you're considering breeding your crays you might want to go for a gentle filter such as a sponge filter to prevent the fry from being sucked in. A heater is not a necessity if your tank is placed indoors and ambient temperatures are stable, but if this is not the case you might want to consider one just to be sure. Dwarf orange crayfish are prey animals that molt regularly. After molting the new exoskeleton doesn't harden right away, which means the crayfish is very vulnerable. As a result, these inverts love to have plenty of hiding places in the aquarium that they can retreat to during molting to avoid any possible predators or aggressive fellow crayfish. 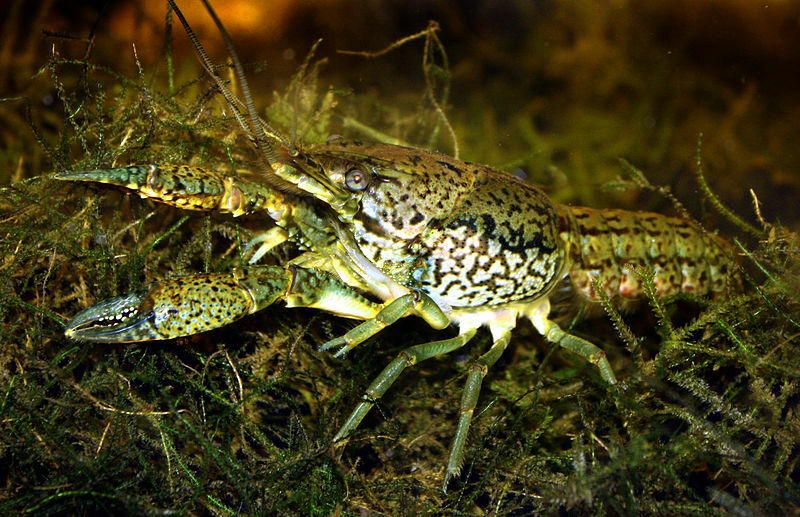 Multiple hides per crayfish are recommended; live plants or shrimp tubes should work well. Dwarf crayfish such as the dwarf orange crayfish aren't too fussy about water quality and you should usually be able to keep them without having to modify the water too much. This makes them a great option for beginners who don't have the experience to keep more fragile and expensive shrimp or crayfish yet. This being said, as discussed earlier dwarf orange crayfish do need a fully cycled tank as they don't deal well with ammonia or nitrite. Nitrate is less of a problem but you should still do regular water changes to remove some of it (25% per week is a good place to start, but the exact frequency depends on factors like tank size and the amount of crayfish). As always the water values should be kept as stable as possible, because sudden fluctuations can easily prove fatal. Crayfish in general are notorious in the aquarium hobby for their aggressive tendencies. Luckily, though, things are a little different with dwarf crays. Dwarf orange crayfish actually don't display aggression at all except during the occasional short territorial squabble with their own species. They can even be kept with shrimp! If you do spot your dwarf orange crayfish eating a shrimp or fish then you can safely assume it was already dead. When choosing tankmates for your dwarf orange crayfish keep in mind that they aren't very large and might easily fall prey to hungry tankmates. Go for peaceful fish only and avoid anything that might be able to fit a crayfish in its mouth. If you're planning on breeding your dwarf orange crayfish in the same tank then it's probably a good idea to avoid fish altogether and only add other invertebrates like shrimp or snails. Dwarf orange crayfish are omnivorous scavengers that will consume anything edible they come across. This makes them a good addition to your aquarium 'cleaning crew': they will eat any leftover bits that your fish miss. A varied diet is the key to a healthy dwarf orange crayfish. A high quality invertebrate food makes a good staple and contains the nutrients your crayfish needs to grow and molt successfully. I imagine a color enhancing food such as this one might be a nice option to go for, as it might also help maintain that bright orange coloration. Supplement with anything you can think of! Frozen foods (mosquito larvae, bloodworms, brine shrimp), fresh blanched veggies, algae tablets, they'll happily devour it all. 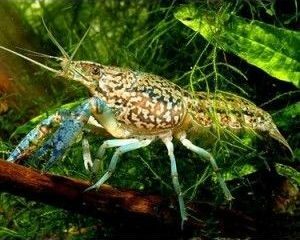 Breeding dwarf orange crayfish is not too difficult and a great option for the beginning breeder. If you have both males and females in your tank, breeding should occur soon enough. The male will pin the female down to mate, after which she 'saves' the sperm to later fertilize up to around 60 eggs. As with shrimp, these eggs will be carried between the back legs ('swimmerettes') until they are ready to hatch. If there are enough hiding places in the tank you don't have to provide any extra care. The young crayfish might spend the first few days after being released in hiding to prevent being eaten. This is nothing to worry about and they should come out to forage alongside the adults soon enough! 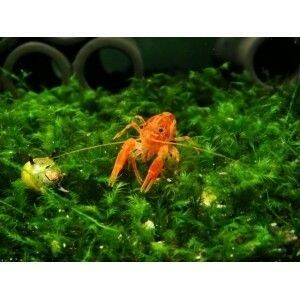 Dwarf orange crayfish have become quite popular in the aquarium trade due to their peaceful nature and fun behavior. You should be able to find them at most aquarium stores. If you don't want to leave the comfort of your home, The Shrimp Farm also sells and ships them right to your doorstep: you can find dwarf orange crayfish at The Shrimp Farm here. This entry was posted in Caresheets, Freshwater Crayfish and tagged mexican dwarf crayfish, dwarf crayfish, dwarf orange crayfish, cpo crayfish on October 11, 2017 by Mari. This entry was posted in Caresheets, Freshwater Crayfish and tagged aquarium crayfish, marbled crayfish, self cloning crayfish, marmorkrebs on October 11, 2017 by Mari. Freshwater Dwarf Orange Mexican Crayfish CPO Safe With Shrimp? 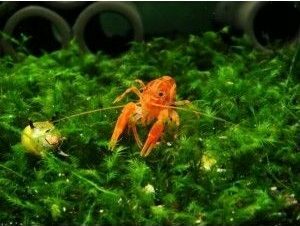 Dwarf Orange Mexican Crayfish CPO Safe With Shrimp? The infamous question has come up again and again with shrimp hobbyist that are looking to add a little more than just shrimp to their aquariums, "Can I keep Dwarf Crayfish with my shrimp?". In a shrimp tank size often matters, more than likely you have several plants and are picky about how the layout looks. You often strive for that "perfect aquascape". When trying to spice things up so to speak, the shrimp hobbyist often has turned to Dwarf Crayfish, which in turn leads to the most popular dwarf crayfish in the hobby to date the Dwarf Orange Mexican Crayfish (Cambarellus patzcuarensis). This Mexican Dwarf Crayfish is something many shrimp hobbyist want to add to their tanks, however the question arises is it safe for my freshwater dwarf shrimp? The Mexican Dwarf Orange Crayfish is found to be beautiful, relatively peaceful, and low demanding. They do not dig into substrate very often, nor do they harm plants. The Mexican Dwarf Orange Crayfish will not harm your shrimp in most cases. If you have ever kept male betta fish you will know that each male has its own temperament, this is the same for dwarf crayfish. In almost all cases I have found they get along 100% of the time with all dwarf shrimp, I often find he shrimp riding on the backs of the crayfish! Mexican Dwarf Orange Crayfish will only harm dead, weak, or sick shrimp. They are culling your Colony of shrimp for you. After reading this you might have this question, "Would you house the Mexican Dwarf Crayfish with your shrimp, prized shrimp?" My answer would be yes! I would not sweat it, I would not even spend a moment laying awake at night thinking about it. Stop worrying and start Shrimp'n!! This entry was posted in Freshwater Shrimp, Freshwater Crayfish and tagged Shrimp Safe Pratices, Freshwater Dwarf Crayfish on January 11, 2015 by Ryan Curtis. This entry was posted in Freshwater Crayfish on April 5, 2010 by Ryan Curtis. My self-cloning crayfish have been at it again. I checked today to see if the offspring have been released from the mother and to my delight they have been. There are about 20 or 30 miniature crayfish running around the aquarium now. I am going to let them grow to near adult size and then try to sell them! If you are interested in buying some, please let me know! Update: Buy self cloning crayfish here! This entry was posted in Freshwater Crayfish on February 22, 2010 by Ryan Curtis. Just a very quick update! About 2 days ago I started to set up the aquariums for this experiment. I will be waiting for these aquariums to fully cycle and then put some Neocaridina heteropoda in these aquariums for about a month or two to make sure the aquariums are ready to house shrimp! This entry was posted in Freshwater Crayfish on June 13, 2008 by Ryan Curtis. As I watch these Caridina sp. acclimate to their new environment I have seen them go threw many color morphs from clear, to blue, to red all the way to brown. Bellow are a few more pictures of these shrimp! This entry was posted in Freshwater Crayfish on June 8, 2008 by Ryan Curtis. Rainbow Shrimp: What are they? There has been a recent flood of wild caught shrimp to the American market as of late and many of these shrimp are difficult to identify. There are many wild shrimp that have not been scientifically described yet and many described shrimp that are new to the Dwarf Shrimp hobby. Many exporters, importers, retailers and even some hobbyist have no clue what they are looking at so they slap the generic “Rainbow Shrimp” name on them. So what is a true “Rainbow Shrimp”? There is no true “Rainbow Shrimp”. The name has been incorrectly put on many shrimp species including Neocaridina Heteropoda (pictured to the right), Caridina sp. “Indian Dwarf”, Caridina sp. “Indian Whiteband” and many, many more. The Dwarf Shrimp hobby is rapidly growing in the United States and it is important for hobbyist to know what they have. Generic names like “Rainbow Shrimp” and “Ghost Shrimp” make it difficult to know what shrimp a hobbyist owns and therefore makes it difficult to care for the shrimp properly. This entry was posted in Freshwater Crayfish on June 5, 2008 by Ryan Curtis.